1. How long will the divorce process take? The process takes an average of 1 hour to answer the required questionnaire. 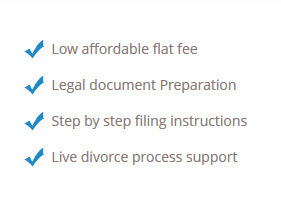 Once it is submitted to us, a legal document preparer will generate the documents. Once the documents are filed with the court according to the filing instructions we provide you with, the length of time will vary, usually anywhere from three to four months. 2. How much are the filing and/or court fees? The cost is $338..00 but we can fill out an application for deferral or waiver of court fees if necessary at no additional cost. There are guidelines for this is based on the clients income and number of financial dependents. The court filing fees are not included in the online packet prices. 5. Is this service available when the spouse lives in a different state? It doesn’t matter where the spouse is physically located or even if they do not know where the spouse is living at the time of the divorce.